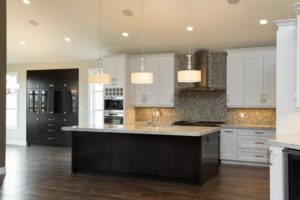 Gallery - Canterbury Homes Inc.
White cabinetry is contrasted with charcoal quartz countertops. 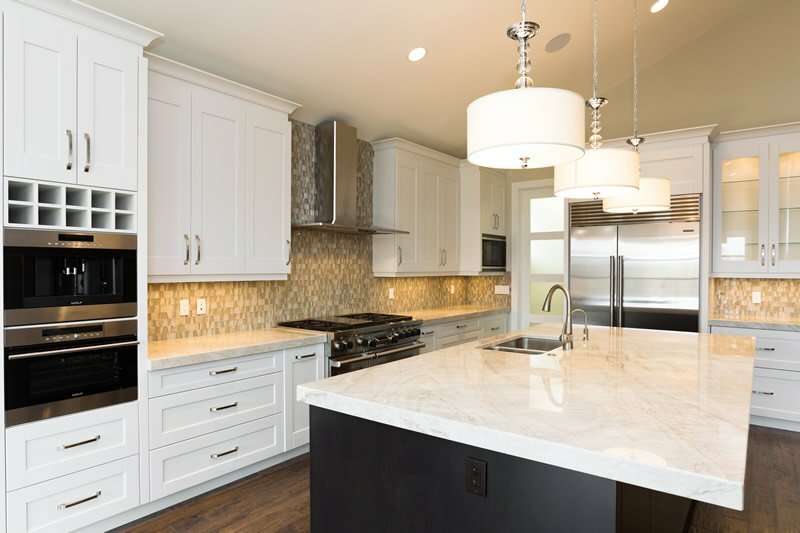 The large custom grey island is accented with a 2 ½” thick exotic white and grey granite counter top. 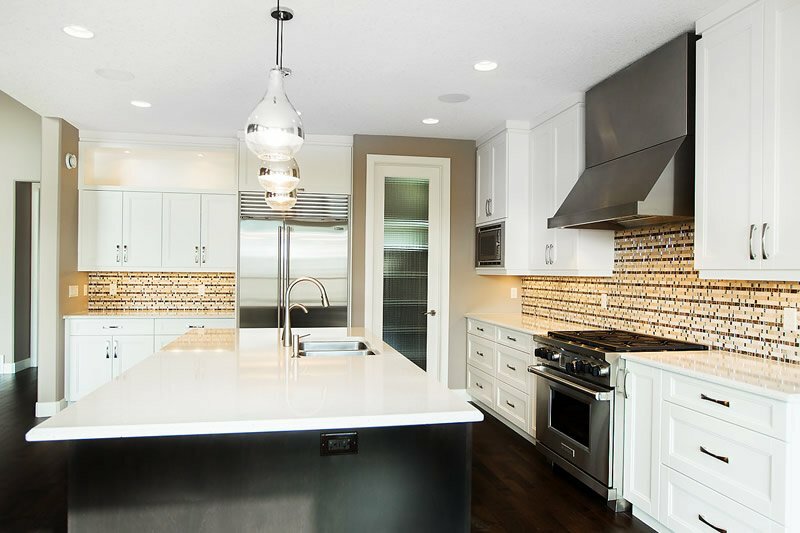 The light grey brick back splash and built in Thermador Appliances are the added touches that make this space one you don’t want to leave. Above the charcoal island are 3 black iron pendant light fixtures wrapped around a sparkling string of chrome and crystal. 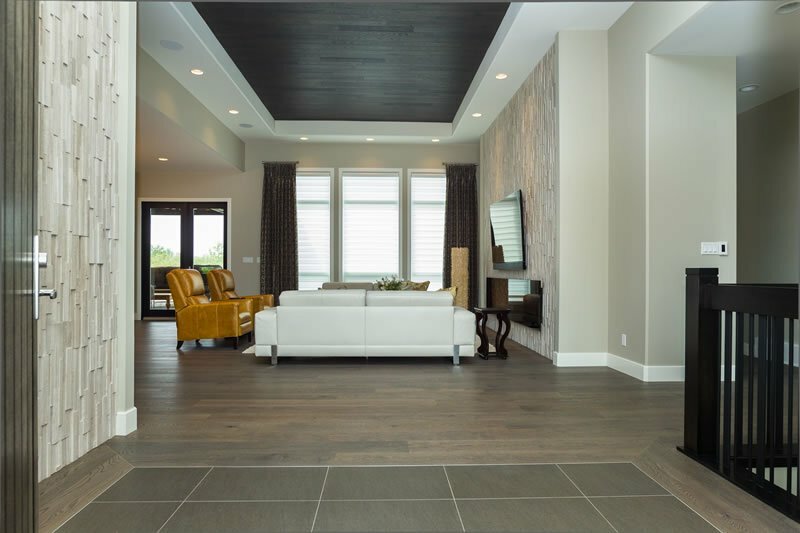 Look up and be pleasantly surprised to see a chocolate brushed oak 12 foot coffered ceiling. 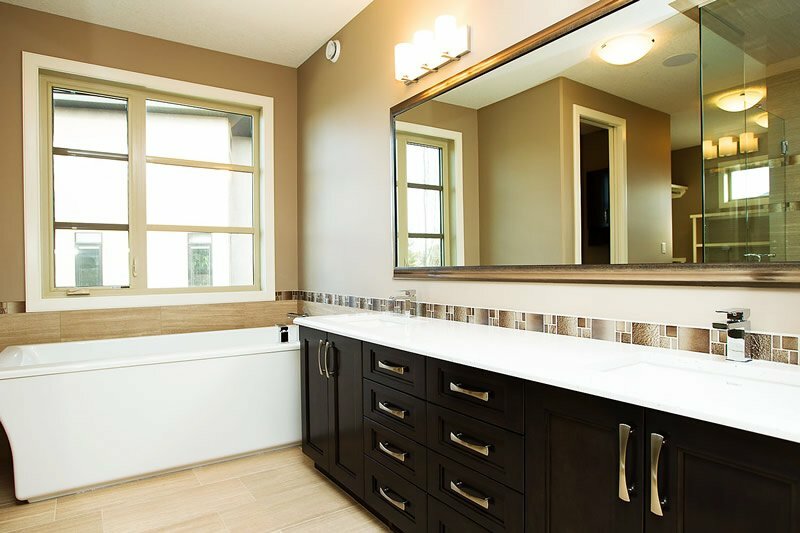 This room seats 10 – 12 comfortably and includes a built in side board topped with an exotic white and grey granite. The walls are two toned with a contemporary wainscoting. 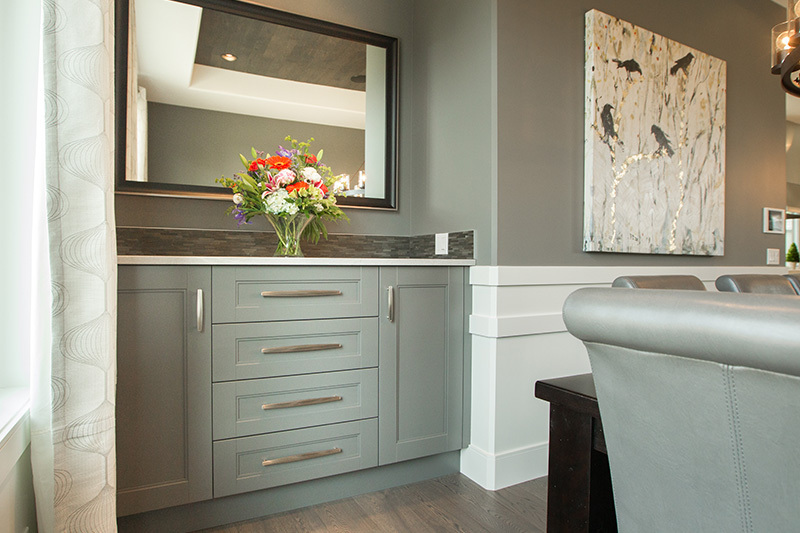 The sideboard is 68” wide x 41” tall, allowing enough storage for all serving items. 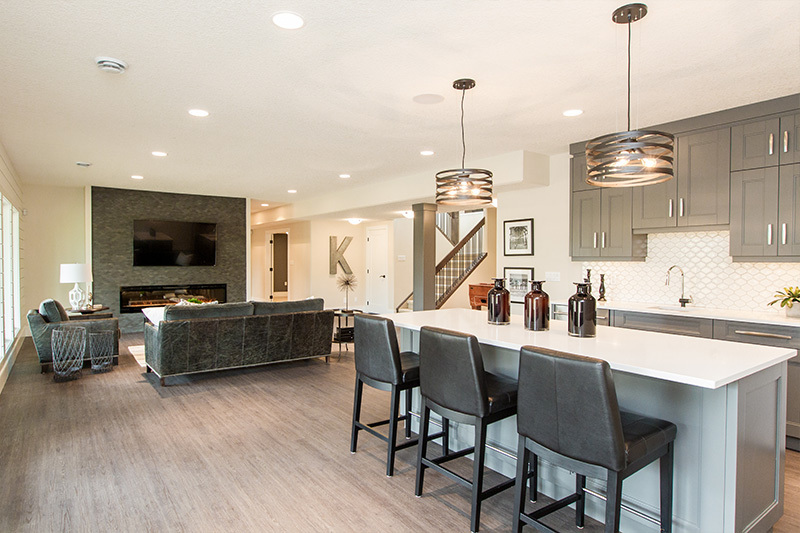 The open concept great room is flooded with natural light and a grand space with 13 foot ceilings. This room’s coffer ceiling repeats the chocolate brushed oak in the adjacent dining room. 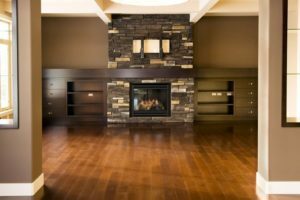 The polished stone floor to ceiling fireplace and wide plank brushed oak hardwood add sophistication and comfort to this space. 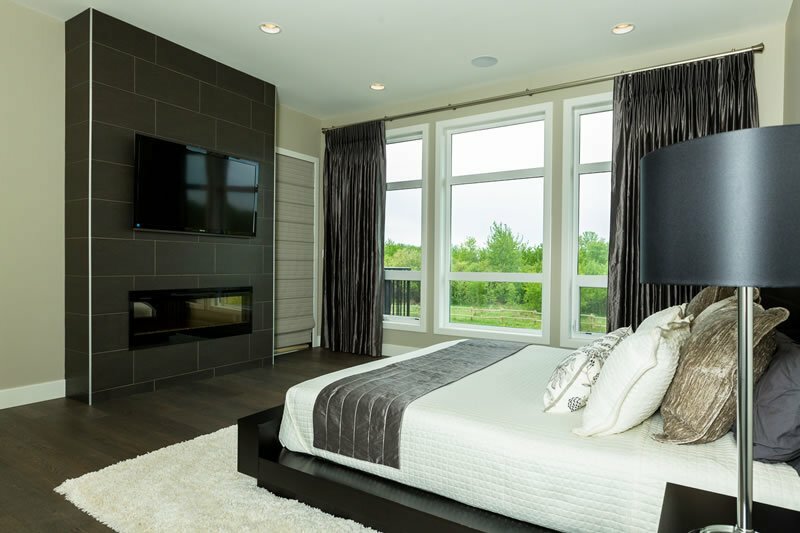 Master Bedroom – A peaceful, light filled space with direct access to enjoy your first cup of coffee on the deck. 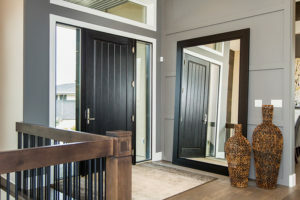 A charcoal grey barn door leads you to a spacious walk in closet including a built in custom dresser. 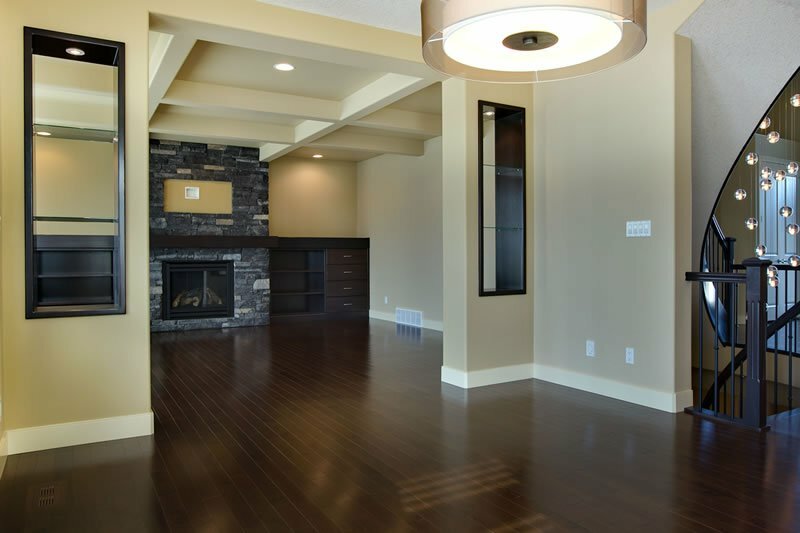 The full height windows spread light throughout this open concept main area. 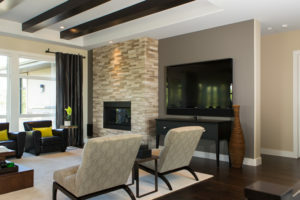 The Bluestone fireplace surrounds a 72” linear fireplace and is adjacent to a custom grey bar with white quartz counter tops, dishwasher and fridge. A grand entrance with 12 foot ceilings, a floor to ceiling 3D stone wall to your left and custom wood/iron stair well to your right. 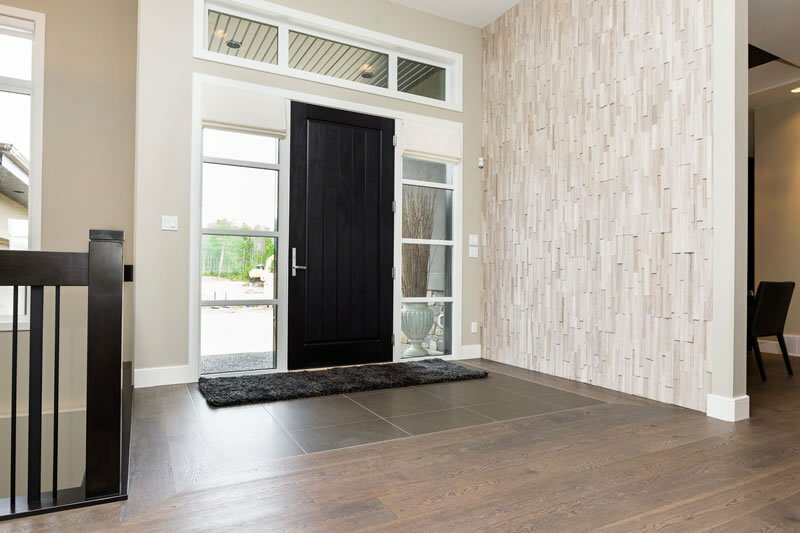 The Foyer inlaid tile floor will lead you directly into the Great Room. 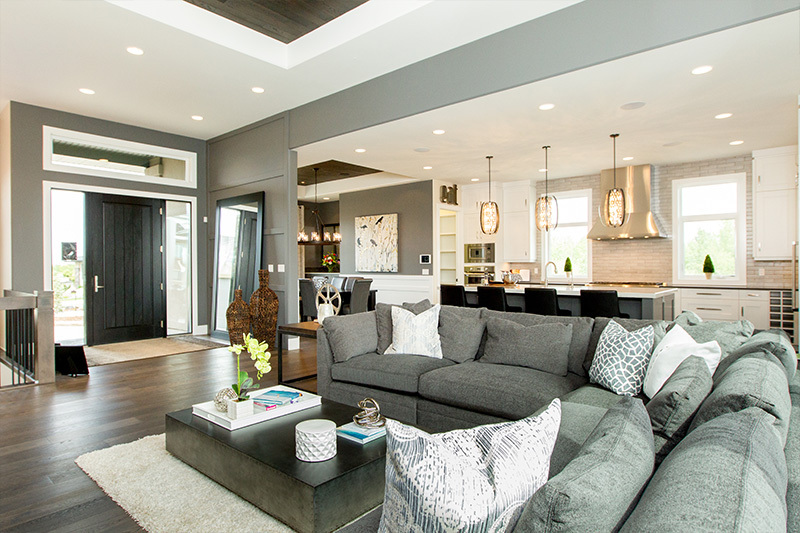 The open concept great room is flooded with natural light and a grand space with 13 foot ceilings. 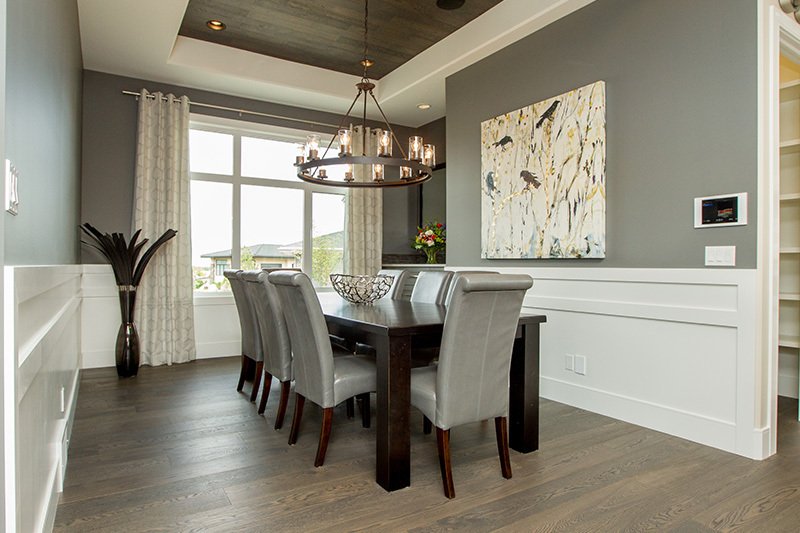 This room’s coffer ceiling repeats the dark chocolate brushed oak in the adjacent dining room. 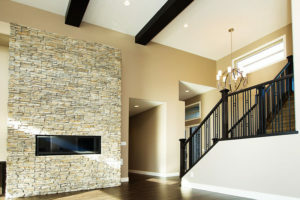 The stone fireplace wall surrounds an impressive 106” linear fireplace. 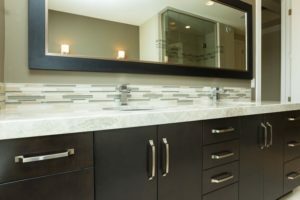 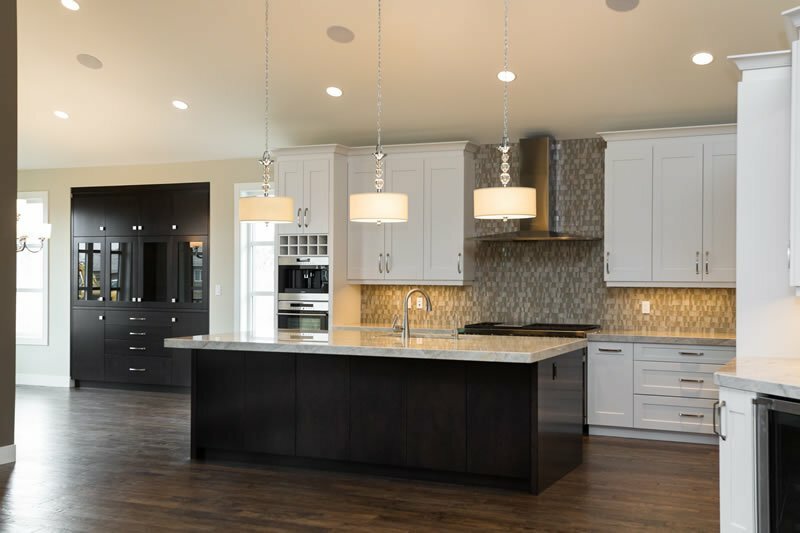 Custom cabinetry is contrasted with charcoal 2 ½” quartz countertops. 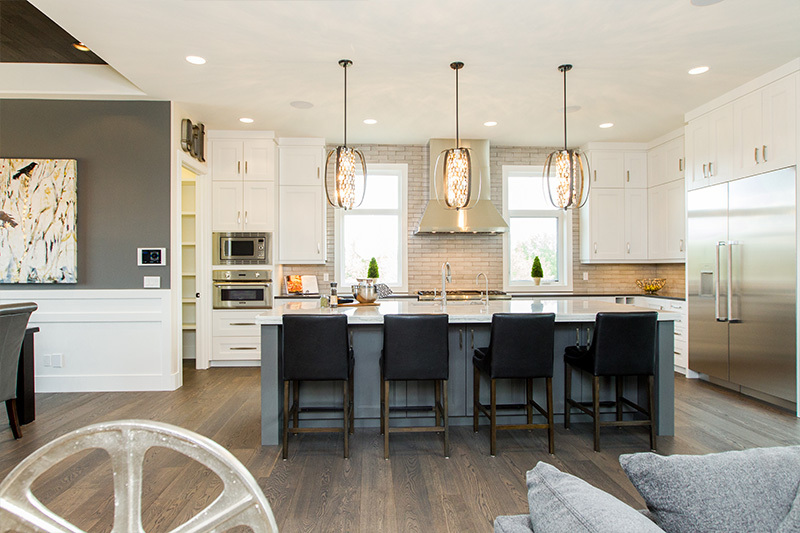 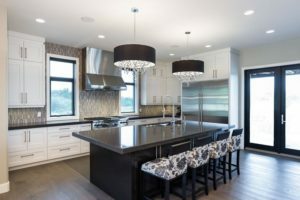 A taupe stone and glass backsplash and bejewelled black drum pendant lights add drama to this space. A large dining room directly off the kitchen makes dinner time accessible and easy. With 10 ft ceilings light is streamed through it’s 3 floor to ceiling windows. 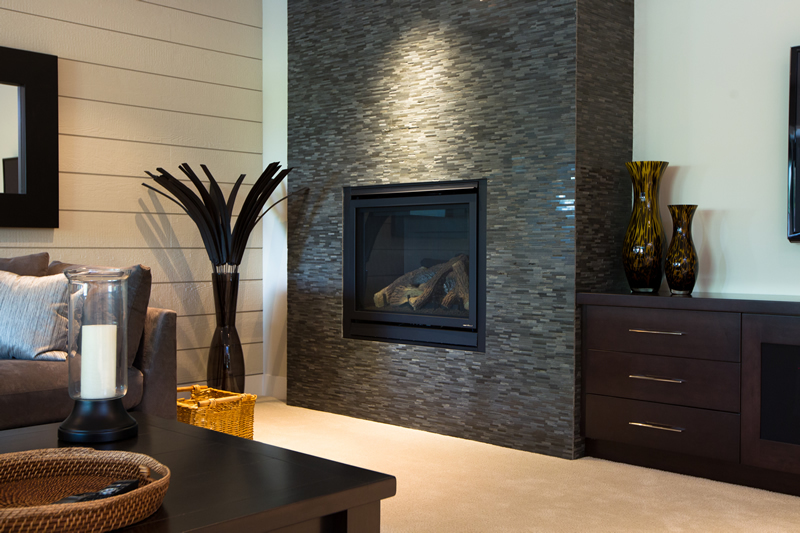 The master includes a contemporary linear fireplace and access to the deck. 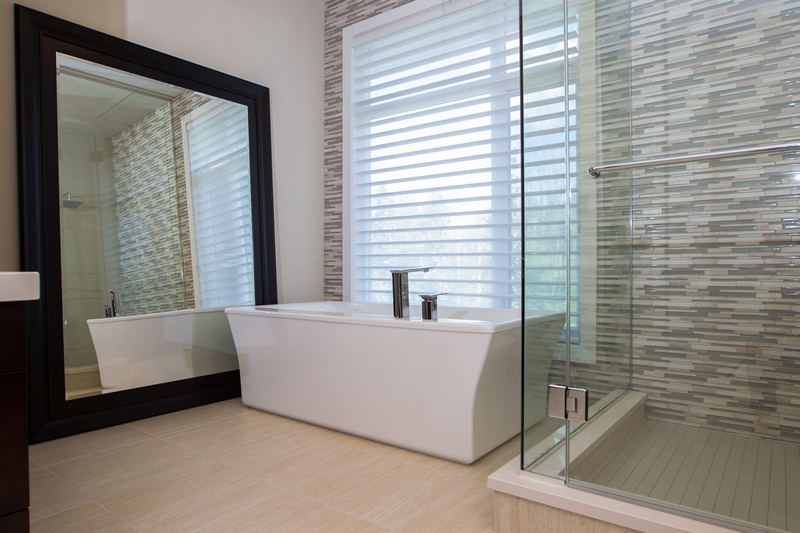 The free standing tub is backed on to an impressive 13’ x 4’ marble his/hers shower enclosure. Dark stained custom cabinets are contrasted by the Carrera marble 2 ½” countertop. 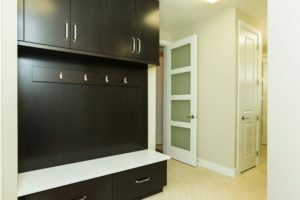 A spacious walk in closet is located directly beside the ensuite for ease of accessibility. An organizers dream. 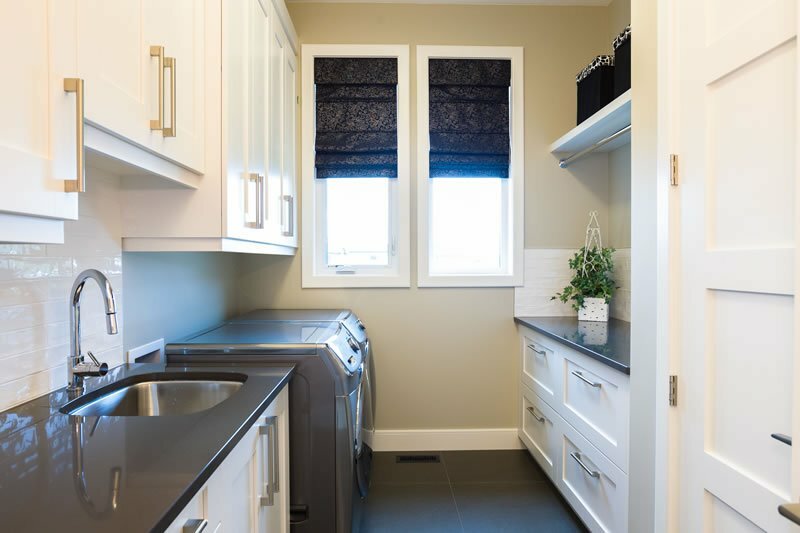 Each drawer serves as a laundry basket allowing you to separate clothes by color, washing instructions etc. 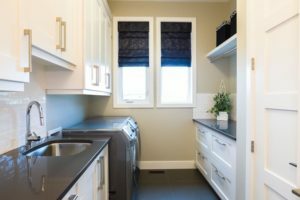 There is an abundance of cabinetry, a rod to air dry clothing, sink, and an added closet to store all your utilitarian items. Hidden off the kitchen with matching built in cabinetry, it is a little haven to keep everything in its place. 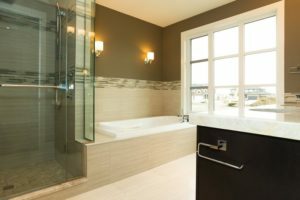 The custom shower with 10mm glass and drop in Air Jet tub are highlighted by the abundance of light through the west facing window. 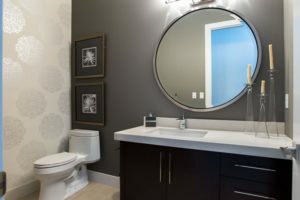 The ensuite features warm grey colored glass vanity sinks and exotic Taj Mahal granite. 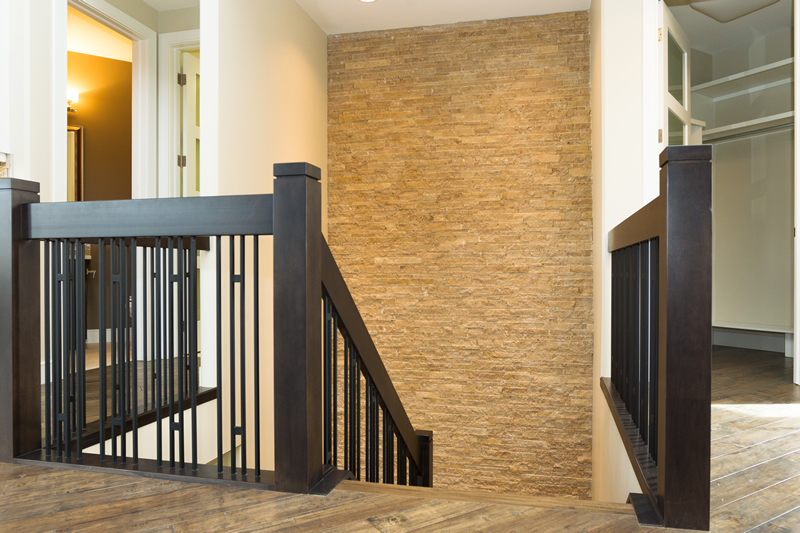 Stair Feature Wall - The floor to ceiling cream stone wall add contrast to the chocolate and metal railing. 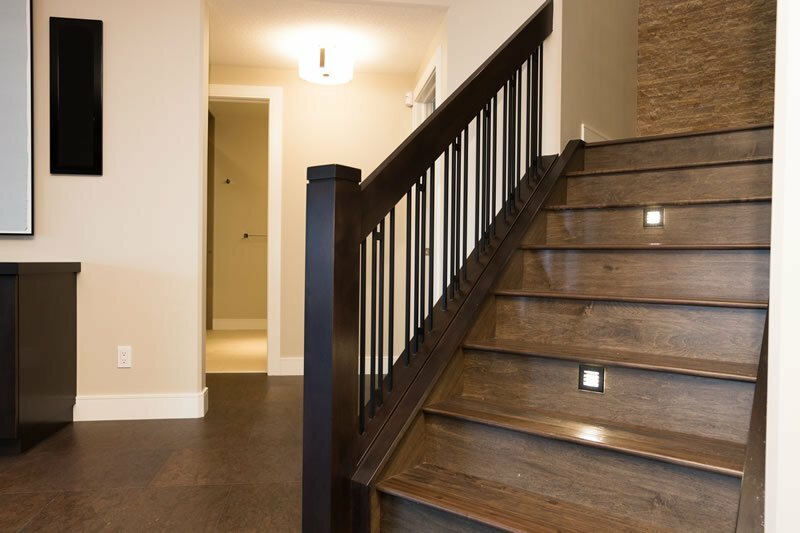 Stair risers are illuminated with led lighting ensuring the safety of your family. A place for everything... hooks for backpacks, coats and dog leashes; a bench to store gloves, mitts and scarves. 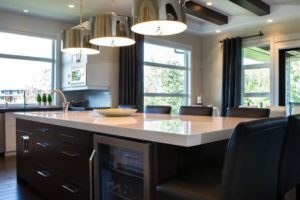 The custom chocolate built in cabinet allow room for all serving items plus the illuminated glass doors offer an opportunity to display special items. 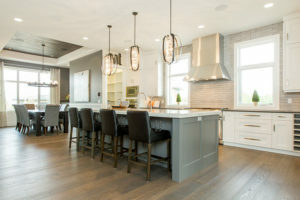 This kitchen invites you to enjoy time cooking and visiting with friends. 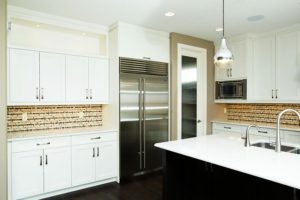 The multiple appliances including a coffee bar and steam oven add luxury to this space. 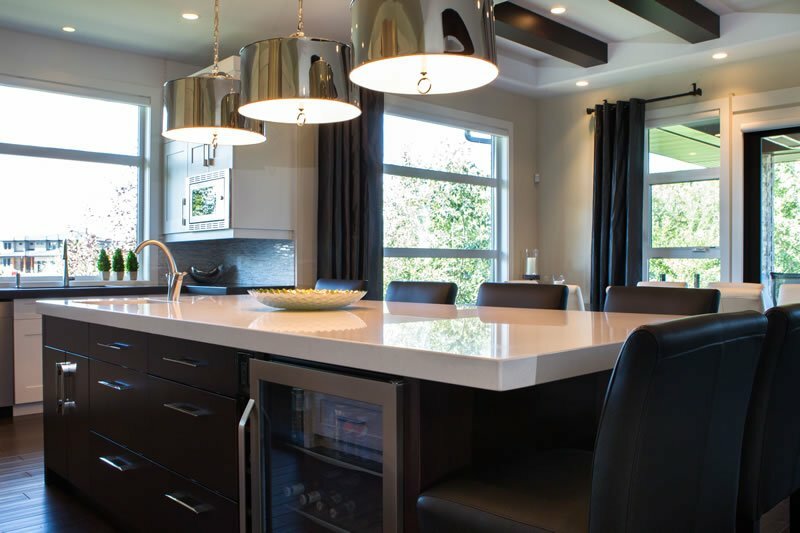 The countertops are exquisite exotic Taj Mahal granite, which are the highlight of this kitchen. Floating shelves and a chocolate glass mosaic backsplash give this bar a contemporary statement. This ceiling height of The Windsor bungalow with loft is accented with espresso ceiling beams and stone linear fireplace. Behind an 8’ glass door; a walk through pantry allow ease of grocery and shopping storage. 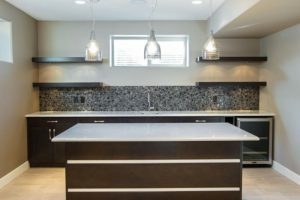 The mosaic stone, glass and metal backsplash add sparkle to this space and compliment the stainless steel appliances and chrome island pendant fixtures. 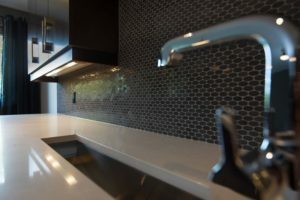 The espresso cabinets are highlighted by the recycled granite and glass quartz countertops. 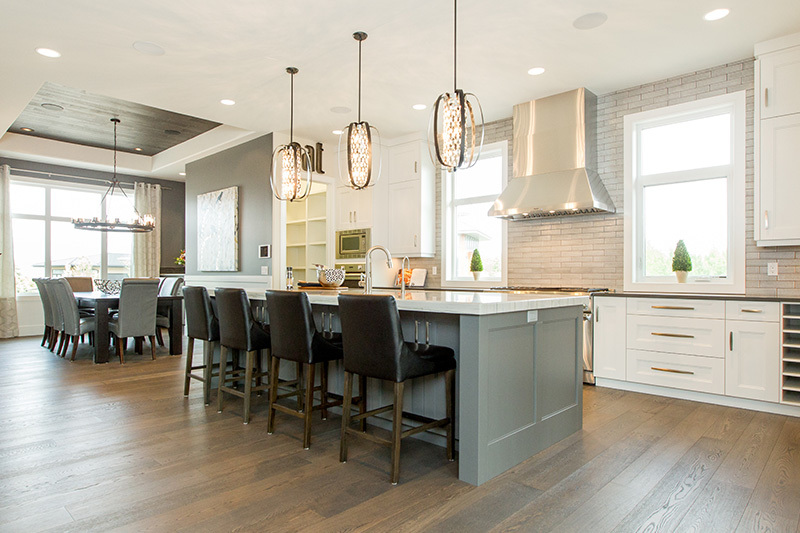 This functional kitchen is both beautiful and functional. 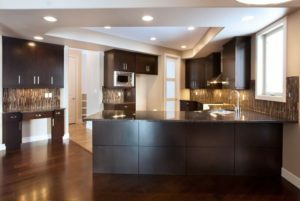 The large peninsula allows space for many cooks in the kitchen; the separate desk area keeps home organization neatly away. 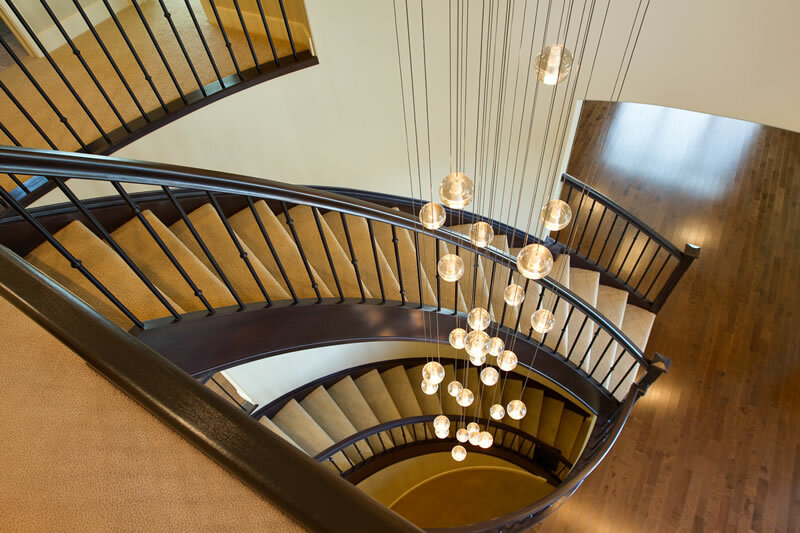 This two level spiral staircase is accented by a custom led glass and wire fixture spanning the opening through both floors. 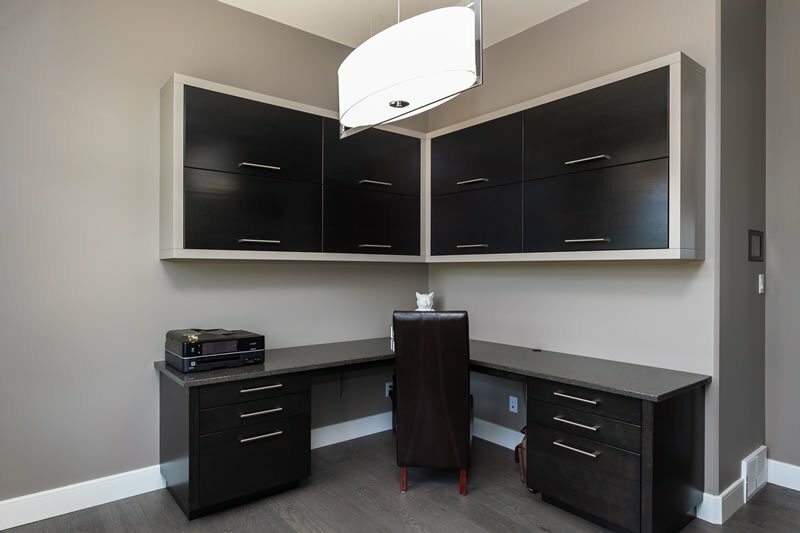 The ceiling recessed coffer is divided into 9 spaces and adding interest as you look up. 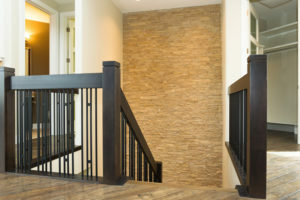 This two story home features an abundance of storage. 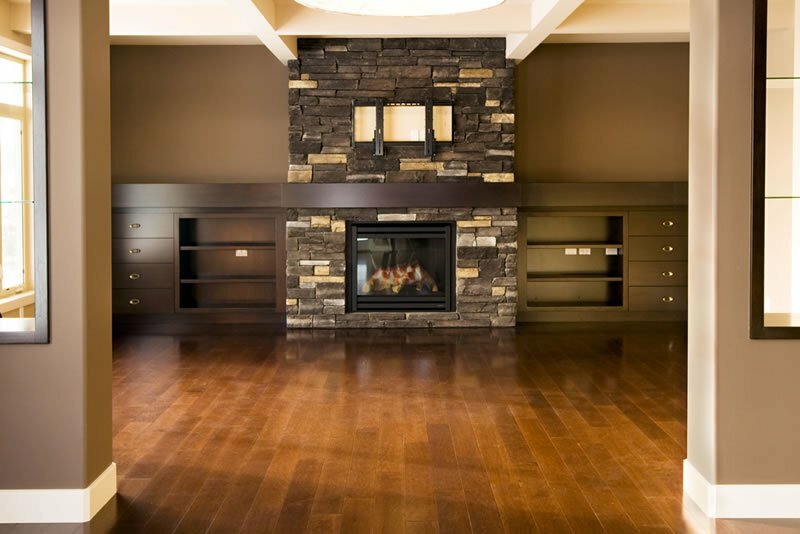 Glass illuminated shelving provide a partial division between dining and family room space. 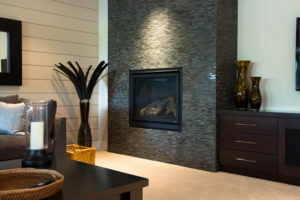 Custom open and closed storage are flanked on either side of a stone gas burning fireplace. 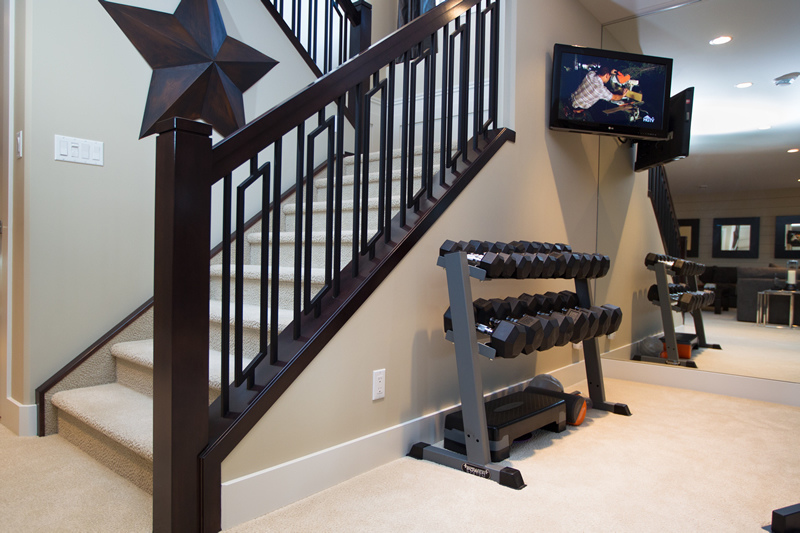 This 20’ x 20’ space is the first room you enjoy when walking through the door. The 11’ ceilings are accented by chocolate 12” beams and floor to ceiling windows and stone fireplace. 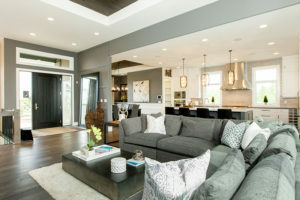 A great place to host guests or relax after a long day. 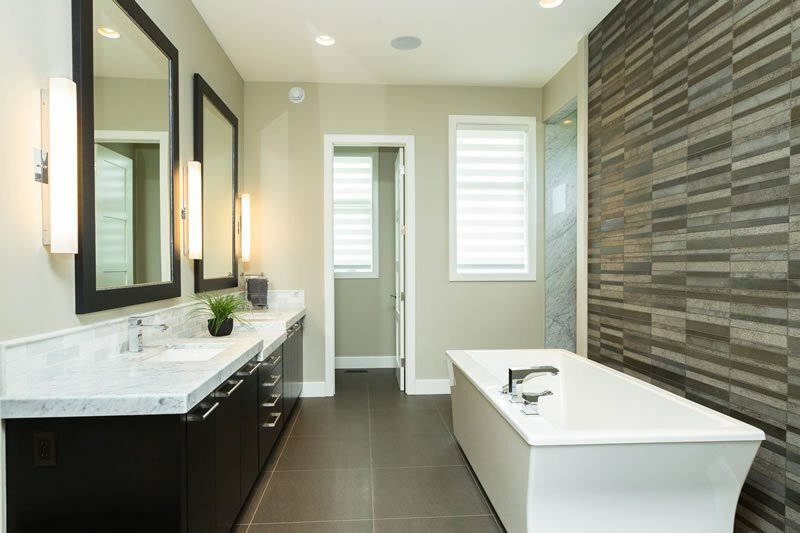 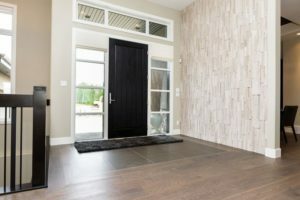 The Ensuite is a relaxing retreat; floor to ceiling custom glass shower and free standing tub are connected by a stone and glass mosaic wall. 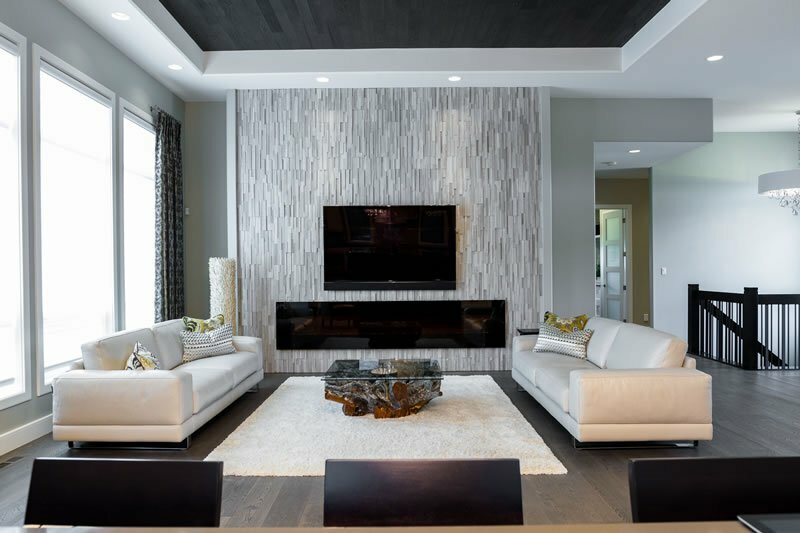 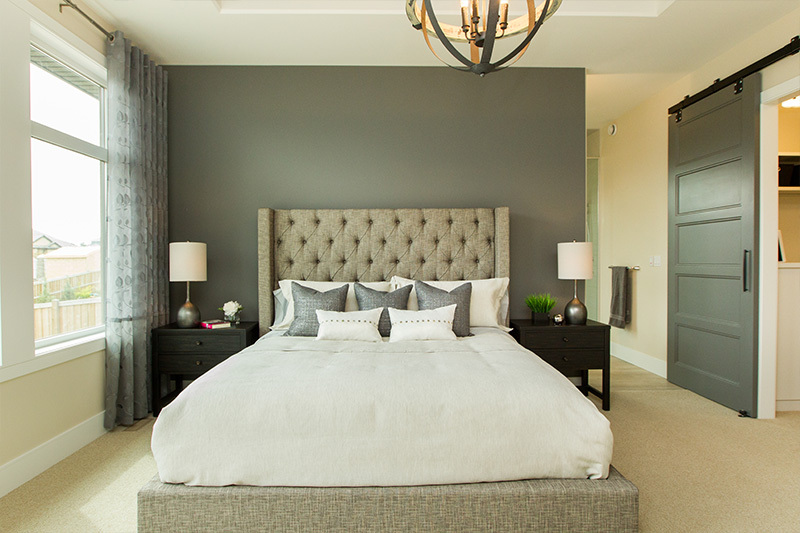 This sumptuous space is accented with warm charcoal walls and two toned alabaster wall paper. This space invites you in with the Bluestone fireplace and shiplap cream feature wall. 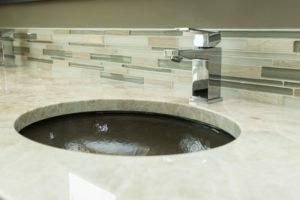 The basement bar shimmers with a Bluestone oval backsplash. The trough sink makes entertaining easy as it doubles as an ice bucket.